Lio (JM de Guzman) suffers from face blindness, which prevents him from recognizing faces—even that of his beloved Shana (Rhian Ramos). Kung Paano Siya Nawala is a bittersweet love story with an unusual twist. 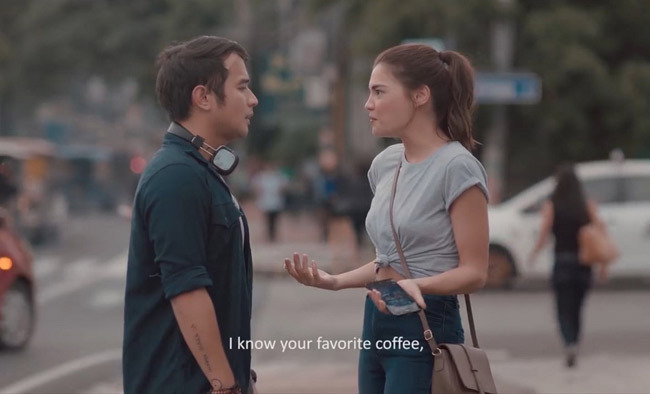 Lio (JM de Guzman) suffers from face blindness, which prevents him from recognizing faces—even that of Shana (Rhian Ramos), the woman he has fallen in love with. Prosopagnosia or face blindness is rarely depicted in Filipino films. It’s a conversation piece on its own, a reason for the audience to be curious about the story and patiently wait for it to unfold. How can Lio fall in love with and nurture a relationship with Shana if he can’t even remember what she looks like, and her appearance registers differently every time they meet? How does a woman as mysterious, beautiful, and free-spirited as Shana let her guard down for a guy who, aside from having a mental disorder, also has a troubled past that continues to haunt him? Shana and Lio’s initial meetings are amusing—even silly—on the surface. When they finally connect and their lips meet, however, one understands that the attraction is more than skin deep. Seeing their love story unfold feels like eavesdropping on private conversations. It’s as if you’re a peeping tom peering into a small hole on the wall of Shana’s room, or an invisible enigma that follows the lovers wherever they go. When they talk, they sound like any other normal millennial couple, whether they’re in a public place or behind closed doors. They cuss in the vernacular when the situation prompts it. The dialogue between them always sounds natural and easy to digest—never sugar coated or doused in theatrical language. Meeting and falling in love with someone with prosopagnosia may be unusual, but Rhian and JM’s characters make us believe that it is possible. Everything they say and do sounds and looks like they could, or they might have already happened, in real life. Lio and Shana’s personalities are not one-dimensional. There’s more to them than being lovers, and this is a good thing. They have families, normal jobs, lives outside of work, and skeletons inside their closets. They both have secrets that they would not rather disclose, things about their past they’d rather forget. These things add layers not only to their personas, but to the story as well. Lio and Shana’s love story is a montage of everyday events--from the time they meet to the period covering their relationship. It is, put simply, beautiful. But because it takes its sweet time showcasing Lio and Shana’s precious moments together, it soon becomes dragging at some point. The pace of the storytelling is a bit slow. And when we finally get to the part when their secrets are revealed and and the drama ensues, the layers—romance, conflict in the relationship, internal turmoil, trouble involving the people around them, among others—topple over one another that it becomes difficult to savor every layer, even if it is integral to the plot. Suddenly, there are so many separate things going on and weaving them together into one fluid tale becomes a challenge. It becomes difficult to jump back to Lio and Shana as lovers when you still have to deal with the issues concerning their past, as well as of other characters. Some of the scenes, although intimate, are tastefully shot, never offensive. As mentioned earlier, it feels like you’re in the same room as the characters; a third person who’s invisible yet privy to their affairs. On top of the dialogue, the framing and the cinematography make this illusion of point-blank intimacy possible. There are surprises that will make you grin from ear-to-ear, such as the identity of the boyfriend of Lio’s mother (Agot Isidro), and what transpires when Lio and Shana go to a bar to watch a gig. JM and Rhian play an unusual couple in the movie, and their portrayal leads us to believe in the power of true love. They are memorable as Lio and Shana, with their quirks, flaws, and everything in between. Joel Ruiz’s full-length directorial debut depicts love the way we all hope it would be: strong enough to sweep us off our feet, our knees buckle, our hearts beat twice as fast, yet gentle in a way that makes us feel giddy and warm inside. Kung Paano Siya Nawala can make both the hopeless romantic and the most cynical swoon. It’s poignant at the right scenes, but also painful when it needs to be. And pain, as we know, is part of falling in love.